Although I appreciate the kind words and those who wish to follow this site , please know it is now a closed site. Thank you . Although flattered that I still receive followers to this defunct site, I feel obligated to stress that I no longer post on Babylon Baroque. Although I personally use this site as an archive for information that is of interest to me, I have since moved on to studio work. Updates from the studio can be found at http://www.boondocksbabylon.com. I would be delighted if you followed me there. In the aftermath of the recent bombing at the Boston Marathon, “why?” is the constant refrain from my mother-in-law smugly snug in her Fox network cocoon. Why, as if we, the “blessed”, are somehow miraculously immune from the horrors the world bears witness to day in and day out. I am just as smugly content in my own cocoon; the very day of the bombing I was reading that morning’s New York Times and blithely by-passed an article concerning a bombing in Somalia, 2o left dead. Yet this domestic act of terrorism does hit home and it does hold my (our) interest , self absorption one of our lesser sins. This self absorption was stunningly reported in today’s NYT, when interviewing a participant, the New Hampshire native reflected “It’s heartbreaking to not cross the finish line, you train so hard for this, …It’s sad, but I’m safe.” although I am happy she is indeed safe I would prefer for her to express gratitude, her concern about having not finished a race seems indelicate given the grief experienced by so many. What has struck me as singularly painful is the amount of amputees these jerry-rigged pressure cookers created. Although not at all cavalier, three reported deaths seemed to me at the time to be less devastating- we after all, bore witness to 9/11. But the subsequent images of amputees: the pain, the pale bloodless faces, the kindness of stalwart by-standers, these images touched me deeply. 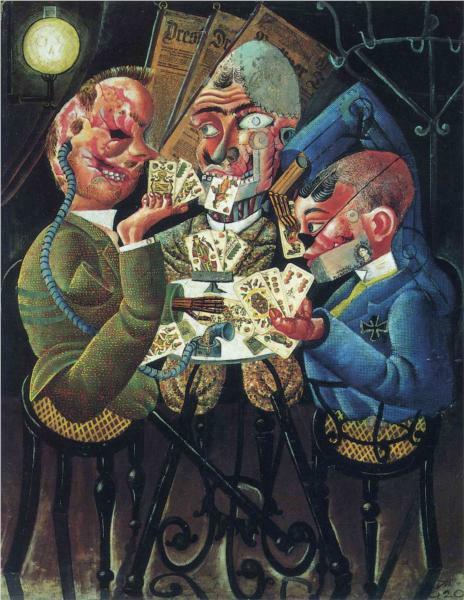 In pondering this current horror, I instictively turned to a master at depicting pain, Otto Dix. Dix as many know, was a fervent chronicler of the unpleasant , the ugliness of man; he was also an expert at depicting the amputee, often as a criticism of war and its excesses. On an unconscious level I turned to Dix and of course found numerous images, disturbing, awful, yet human. I will not post them all, the link above provides a full catalog of his work, but this one, from 192o, The skat Players is a personal favorite. The following link from MOMA gives an insightful analysis of the work, MOMA link . This will pass, but in the mean time I hope to carefully and thoughtfully take every act of terror personally, or to at least read the full article. It is the least I can do. The notion of Hell Mouth has been on my mind, Holy Week has just passed, Christ’s descent into Limbo, often referred to as the Harrowing of Hell being first and foremost. I also happen to be working on a series of painting in which the Gates of Hell feature more or less rather prominently. To see examples of the progress check out my studio journal Boondocks Babylon, link in sidebar. 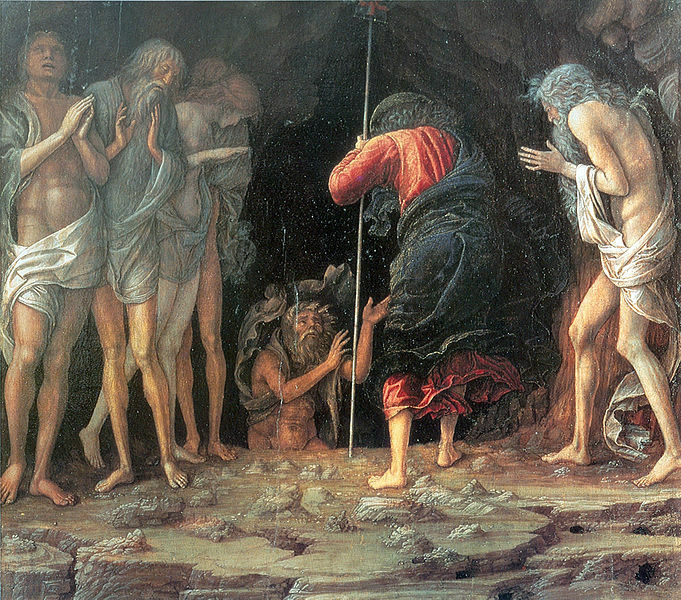 My most direct inspiration for Hell Mouth being Andrea Mantegna’s depiction of Christ’s descent into darkness. 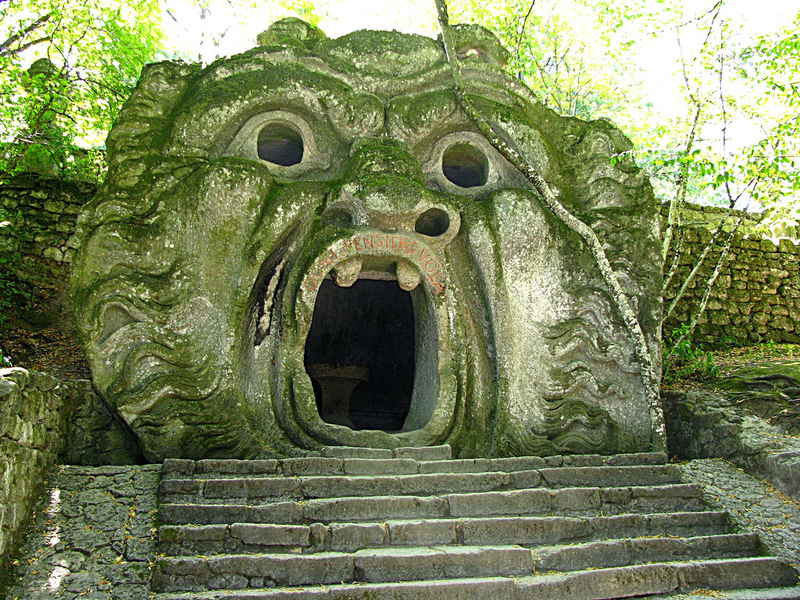 Another inspiration, one I have turned to time and again is the monstrous gates at the Parco die Mostri. 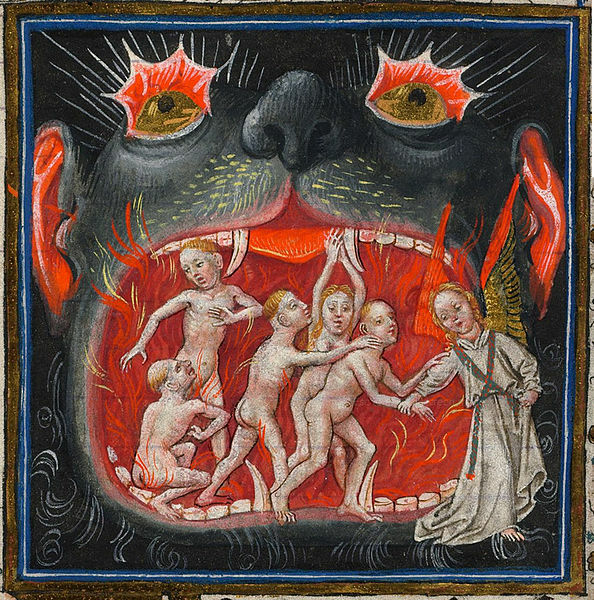 In my research, collecting various reference materials I soon came to realize Western Christians weren’t the only ones depicting the entrance to the Underworld with such ghoulish excess. 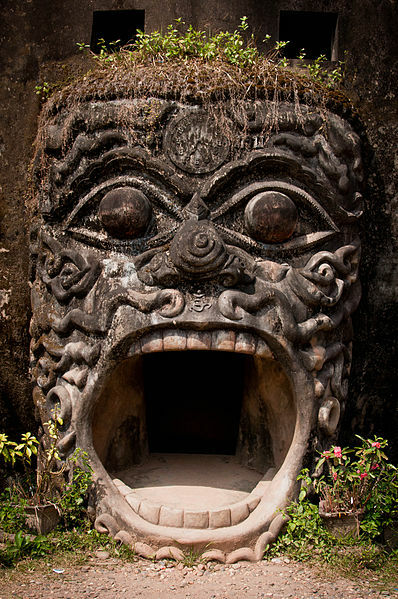 Examples could be found in Asia, most specifically outside of Laos at Xieng Khuan, often referred to as Buddha Park. although not ancient, I believe built mid-century, they draw upon an outlandish tradition, clearly delighting in the creation of such demonic follies. One may also turn to Mesoamerica at the Maya site of Chicanna. At the site “monster mouths” had provided a dramatic backdrop for ceremonial processions, now marvelous photo opportunities. 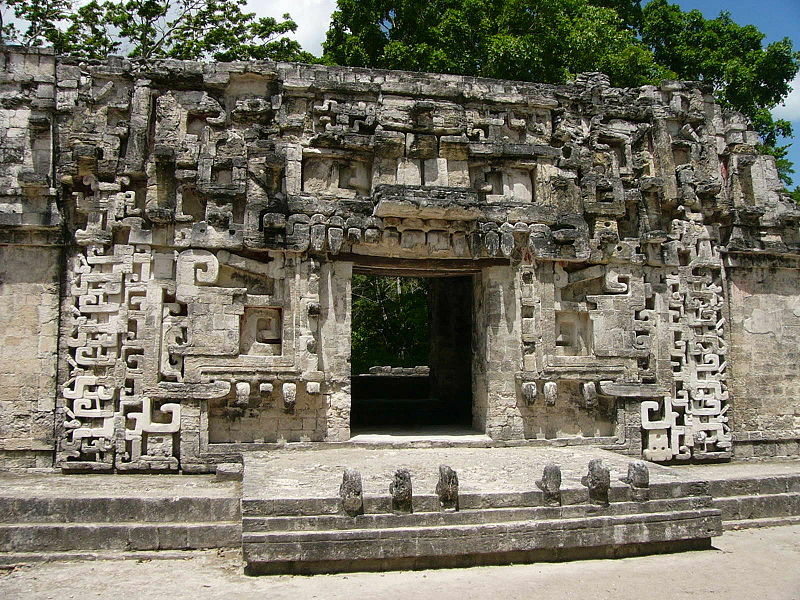 For those not familiar with Mayan architecture the details can be puzzling given the geometric stylization, I suggest enlarging the image (all of the images for that matter). The eyes and teeth will become visible as you examine the complex design ;the visual puzzle it part of the pleasure I find in Mesoamerican art. 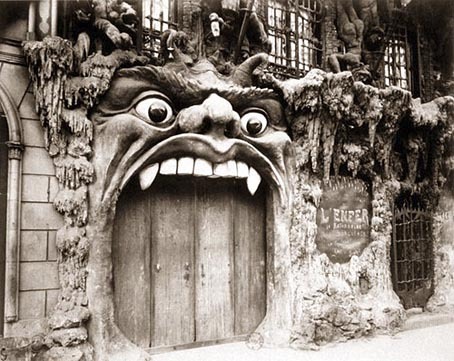 But I must confess the Hell Mouth that touches my heart the most is the architectural pastiche found in Montmartre at the sublimely bizarre cabaret l’Enfer. The entrance captured below by Atget. 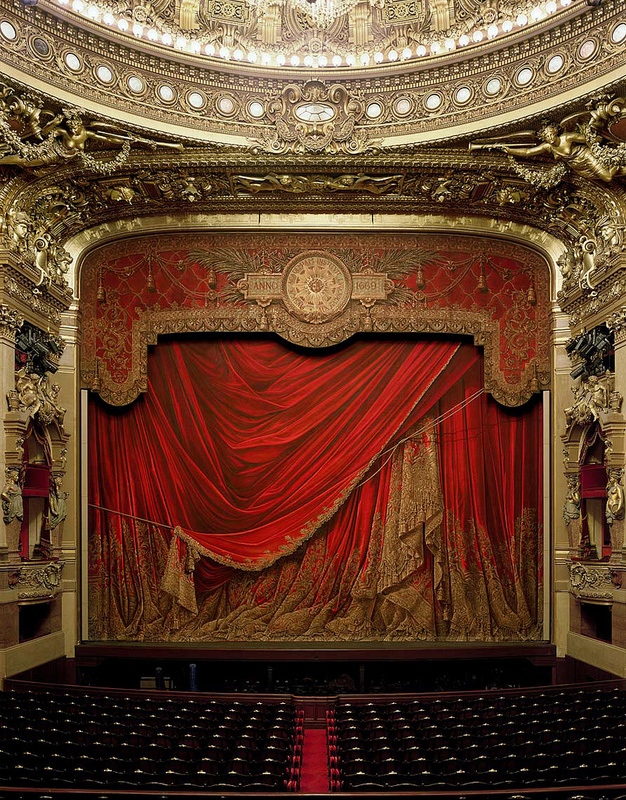 The excessive sense of fun is such a pleasure , Philippe Jullian in his indispensable Montmartre tells us that the facade is essentially cardboard and plaster- but what wondrous paste. The above image is terribly small, but if you are interested more images can be found at this link. 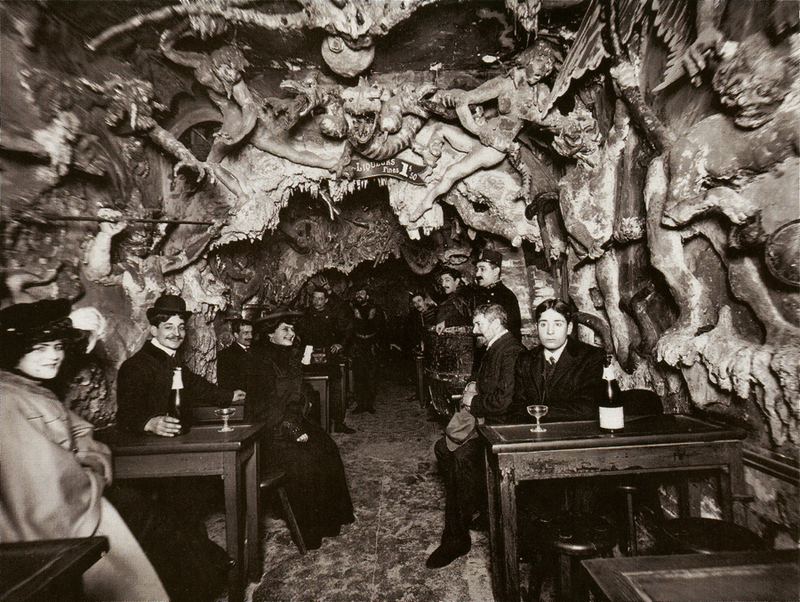 I’m particularly delighted by this interior image, I snagged it from the wonderful blog Haunted Lamp (see sidebar) quite some time ago and I have treasured it ever since. In case you haven’t had your fill of fin de siècle smoke and mirrors check out this video clip bursting with vintage posters and publicity shots. I’m tickled by it . As is so often the case this blog acts as a great organizing tool for my ideas and interests; I am so pleased that so many readers have shared these interests. As the feast day of St. Patrick is fast approaching , I thought it a good idea to remember that Ireland has not one but three patrons. The familiar Patrick, St. Columba (perhaps another post) and dear Brigit-Brigid-Bridget (feast day Feb.1). 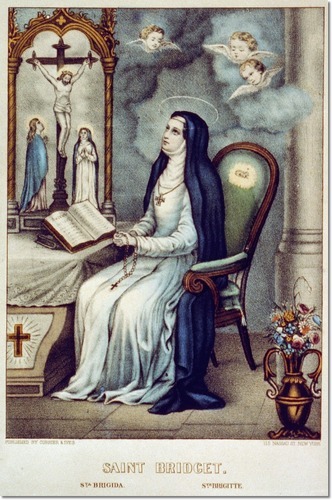 I start with this very sentimental image as it is in my own collection of saints. I have owned it for years but for some reason I have never before realized/remembered she was the patroness of Ireland. Reading the NYT the other day, an article concerning an outburst of thefts, holy relics being the target , I was relieved to hear that the “Mary of the Gael’s” jawbone was indeed safe and sound ,only the reliquary was stolen. Looking up from the paper I began to view my now familiar Bridget with new sense of appreciation. 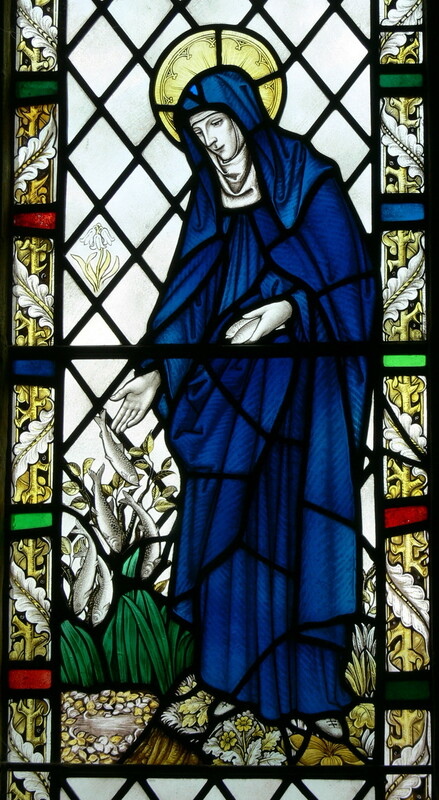 Brigit of Kildare (451-525) is best known as the foundress of a school of art known for its metalwork and illumination. The school is most remembered for the Book of Kildare, now lost to time. 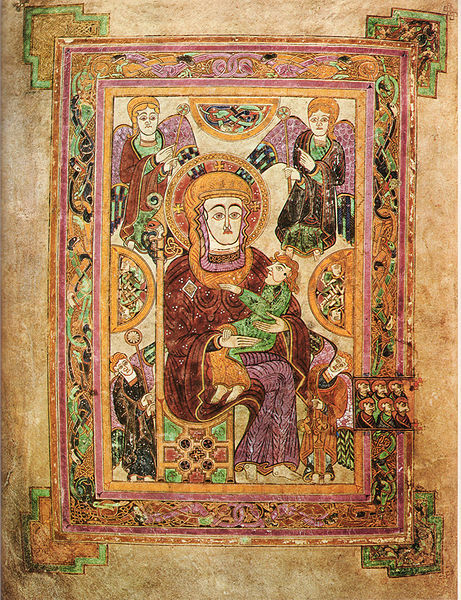 We do of course have the familiar Book of Kells, so I will include an illumination of the Madonna and Child essentially because it is lovely. For more info concerning Brigit, check out this link. With that, have a very happy Saint Patricks Day! You may have seen this video clip, but I hadn’t until this evening when my dear friend Eleanor emailed a link , quite large and glorious link I might add. Alas I am having trouble accessing the larger format, but the enclosed link is still pretty spectacular. Aside from the sheer breathtaking beauty of hummingbirds and iridescent bees, the bats are what blew me away. A long time lover of the little winged buggers, the close-ups in this clip are stunning. The mama bat with her kitten (?) is frankly too much. Delightful beyond measure. I have for some time felt a terrible ennui concerning posts, truly struggling to find points of interest and the words to express them. The truth is I am entering a period of reflection, I find myself more and more interested in MAKING, instead of discussing (at times pontificating) about what has been made. My blogging friends , Thom of the marvelous Form is Void and the very fine artist Clive Hicks-Jenkins have offered splendid support in this arid period. As have other readers, I appreciate that. Clive in particular has offered wise advice, if you are not interested in yakking away ,why not post the progress of your work? I had thought of that before, and I have from time to time posted snippets of my work. But I confess a hesitancy. When I have posted work the response has from time to time been quite vitriolic, I was shocked by the harshness. I am self taught/self learning, it is often a rough road for me. I struggle with how things “ought” to look, my desire to emulate work that I so enthusiastically admire and a constant fear that the sand is slipping away so very quickly. At times it is crippling, the harsh critique, even when warranted- which most likely it was- only added to the chorus within my head. For that reason, I have hesitated to take Clive’s advice and emulate his own delightful Artlog. But I have now decided my timidity is hampering any opportunity to record my progress, to explore other options and to openly engage with others. For many (most) of my readers the new blog Boondocks Babylon will be of little interest. It will be a space devoted to personal reflection, my struggles in the studio and day to day concerns. I really ought to make it a private blog, but I have developed friendships through Babylon Baroque and wish to extend an invitation to those readers to pop in from time to time. Babylon Baroque will continue, the posts may be less frequent, but my interests in art and culture will surely be piqued once again ; I will reserve this blog for established art. For now, Boondocks Babylon will keep track of my own daubs.